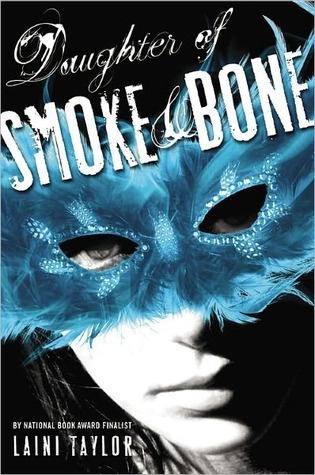 Midnyte Reader: Daughter of Smoke and Bone. 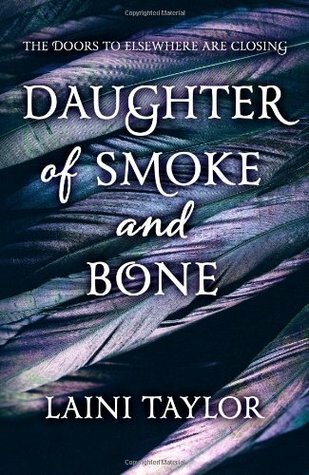 Title/Author: Daughter of Smoke and Bone by Laini Taylor. 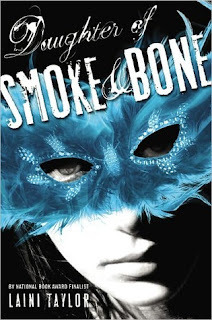 Favorite character: Karou and Brimstone. Favorite quote: "He was copper and shadow, honey and menace..."
"The air in the grove was rich enough to sip, full enough to dance with." All in all: Breathtaking and beautiful. Thoughts: I waited so long to read this book. I just kept hesitating every time I saw it on my book pile. When Karen from What It's Worth said she was going to read it, I decided to join her and read it as well. You can read her awesome review HERE. One thing that surprised me is that it didn't start out with a flash like so many books do today to grab your attention. (Well that's what all the writing teachers say right? Start with a punch!) However, this is how most books I've read all my life have started, with an introduction to the main character in order to get to know him/her. I loved it. 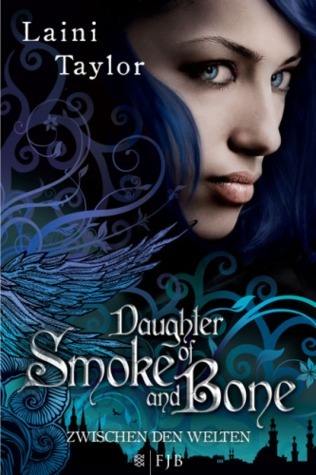 I was drawn to 17 year old college student, Karou, her artistic flair and her blue hair. The action is like a boulder going downhill and picks up speed as it moves. It also picks up details, emotions, backstory and characters. The mythology that Taylor creates is breathtaking in it's imagination and scope. The entire tale is one big puzzle that gets unravelled a bit at a time. I have never read a story crafted quite like this one. Even if you don't like Angel and Demon mythology, this story could relate to any two different warring factions. The author's writing is exquisite and creates a canvas of soul wrenching emotions. Her details are concise, the way she clearly shows Prague and Morroco in so much depth that now I want to visit. The landscapes, the characters, even the war are so well fleshed out that I felt as if I was reading a storybook with pictures as opposed to a novel with only prose. I also want to point out the clever chapter titles. I like the creepiness of it, the otherworldy-ness as well. How shadows didn't match their owners and the details of some of the demons add to the richness of this world. It feels clandestine and mysterious. Karou is a wonderful protagonist. Spirited, innocent, kind and impish. She is someone you would definitely want as a friend, someone I would want to be...or would want others to see me like her. "There was almost always something to take delight in, if you were trying." Karou thinks at one point, and this sums up her optimistic character. However, she is lonely at heart and this adds to a wistful presence. Her discovery and growth throughout the story bring even more to her character. The romance in it is half expected, and some aspects of that didn't work at first, but it all felt right to me eventually. Akiva, the male lead character is fierce and frightening and has a lot to learn, but also has a lot to teach. He has been changed by a past event and will have to re-evalute his perceptions. This is a sophisticated story with surprises and twists. It brought something different to the table and in a creative style. If you have been waiting to read this book, don't wait any longer! great review and i loved this book too. glad that you read it along with karen. Isn't she awesome. This is one of my favorite books of the year, and I suspect will remain an all-time favorite. I read another review where they said Laini Taylor was a master wordsmith. I have to agree. She's brilliant! I've been a bit hesitant to read this one as well. With all the praise it's received, I feel like I'll be heartbroken if it doesn't work for me. But I love this "I felt as if I was reading a storybook with pictures as opposed to a novel with only prose." That is WOW, right there. I'll have to give in and read it. I'm sure I won't be disappointed. @Julie-Yes, she is awesome. I'm so glad I read this! @Ems-"Master Wordsmith" sounds very apt. I wish she would teach a class! @Missie-I really hope you read it because I would love to hear what you think. Love comparing books we've both read! I'm so glad that you liked it! I agree that there are parts of the book that I was skeptical about as I went through it, and it seems like the general consensus from most bloggers is that this took them a peculiarly long time to get through (it sure did me), but I think that if you stick with Laini, it all untwists itself and makes sense in the end. And her writing is just absolutely breathtaking. I almost wish I had waited a little longer to read the book because that ending nearly KILLED me! Can't wait for the next one! @Kelsey-Actually, I read this one very quickly. I really couldn't put it down! Awesome review..i like you have had this and it just keeps shuffling around my tbr pile. The world building sounds lovely as do the characters. Thanks for reminding me why I bought it! I didn't immediately like the romance either. But it DOES grow on you, which I think is a challenge books usually don't succeed in.